The Hate U Give is a young adult novel by Angie Thomas. It follows events in the life of a 16-year-old black girl, Starr Carter, who is drawn to activism after she witnesses the police shooting of a childhood friend. 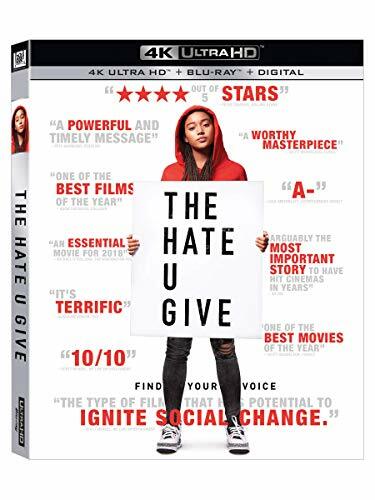 Purchase The Hate You Give on Ultra HD Blu-ray Today! THE HATE YOU GIVE is a hard hitting, touching, yet politically relevant and poignant film! An absolute much watch for those in America to see life through a different lense to help better understand the hardships of ethnicity in the United States. As much as one may presume it’s exaggerated for Hollywood, it’s just as much reality and can’t be dismissed. While films like Black Klansman is being nominated for Oscars, THE HATE YOU GIVE is another film much deserving of that same spotlight. THE HATE YOU GIVE shows the struggles and hardships that not only minorities face, but also the police officers in our Communities. It’s a worthy watch and likely eye opening experience for many. Amandla Stenberg’s performance is Oscar worthy! Fox has once again given this title it’s HD Premium label. One would think that would need Atmos and Dolby Vision, but once again this proves otherwise. Available is HDR and admittedly its a clean and wonderful 4K Transfer with nothing to complain about, but I was a bit surprised this got the Premium label. Never the less the film looks great in both blu-ray and Ultra HD Blu-ray. THE HATE YOU GIVE comes to Ultra HD Blu-ray with a DTS HD Master Audio 7.1 Audio Track. The film has everything that is needed to impress in an audio track given that it has fires, gun shots, riots, yelling, great music, and more! Even the menu has a sensational title track that you just cant help but have the feels. The Hate You Give comes to UHD and Blu-ray with the following Special Features.